The Boston Institute of Finance online service (the "Service") and related web sites (the "Web Site") are provided by Boston Institute of Finance. Use of the Service and of the Web Site is subject to any written agreement that has been executed by and between Boston Institute of Finance ("BIF") and any entity, such as your employer, that is compensating Boston Institute of Finance for your use of the Service and Web Site, or, in the absence of such an agreement, this End-User Agreement (the "Agreement"). The terms "you" and "user" refer to all individuals and entities accessing the Service and Web Site for any reason. By using the Service and Web Site, you are indicating your agreement to be bound by this Agreement. In the event that your employer or any other third party has requested BIF to provide access to you, you represent and warrant that you have authority to bind such entity. BIF may revise this Agreement at any time by posting an update to this page. You agree to pay the posted fees for the Service. You authorize BIF to charge your credit card for all fees you incur for use of the Service. If BIF does not receive payment from the card issuer, you shall pay BIF all amounts due upon demand. BIF may take commercially reasonable actions to validate your credit card. You shall pay any taxes, including personal property taxes or sales taxes, resulting from use of the Service. By enrolling in a payment plan over multiple months, you authorize BIF to automatically charge your credit card every month until the tuition is paid in full. You also agree to make all the payments until the full tuition is paid off. Discontinuation of payment will result in immediately suspension of access and withholding of transcripts and certificate of completion. You have the right to a refund within 15 days from date of purchase. No refunds will be granted after 15 days from purchase. No exceptions (including medical, financial or any other reason thereof). Refunds are granted only once for first-time students. Re-enrollments, extensions and offline materials are non-refundable. BIF reserves the right, at its discretion, to modify the Service, this Agreement and the fees for the Service at any time upon thirty (30) days prior notice, written or electronic. You shall have the right to terminate this Agreement by providing BIF written or electronic notice within fifteen (15) days following receipt of notice of any (i) modifications to the Service that would result in a material decrease in the content of the Service, (ii) modifications to the Agreement that would materially decrease your rights or materially increase your obligations under the Agreement, or (iii) increases in fees. Failure to so terminate shall constitute your acceptance of such modifications. BIF grants to you a non-exclusive, non-transferable right to access and use the Service for which you have paid the applicable fees, during the period for which you have paid such fees. The Service, including without limitation all text, graphics, sounds, images and other materials contained therein, are owned by BIF and its third-party content and service providers and are protected by United States and foreign intellectual property laws. Any use of the Service except as permitted under this Agreement is strictly forbidden and may violate copyright, trademark and other laws. You may not sell or modify the Service or reproduce, display, publicly perform, distribute, or otherwise use the Service in any way for any public or commercial purpose. You may not copy, disassemble, modify, reverse engineer, decompile or adapt the HTML or other code that BIF uses to generate its pages. This code is also protected by BIF's copyright and other intellectual property rights. Upon completing the Service's registration process, you have entered a password and account designation (your e-mail address). You are responsible for maintaining the confidentiality of the password and account, and are fully responsible for all activities that occur under your password or account. You agree to (a) immediately notify BIF of any unauthorized use of your password or account or any other breach of security, and (b) ensure that you exit from your account at the end of each session. General Rules: You may not use the Web Site in order to transmit, distribute, store or destroy material (a) in violation of any applicable law or regulation, (b) in a manner that will infringe the copyright, trademark, trade secret or other intellectual property rights of others or violate the privacy, publicity or other personal rights of others, or (c) that is defamatory, obscene, threatening, abusive, hateful, or otherwise objectionable, in BIF's sole discretion. Security Rules: You may not violate or attempt to violate the security of the Web Site or use the Web Site to violate the security of other systems or Web sites by any method, including, without limitation: (a) accessing data not intended for you or logging into a server or account which you are not authorized to access, (b) attempting to probe, scan or test the vulnerability of a system or network or to breach security or authentication measures without proper authorization, (c) attempting to interfere with service to any user of the Service, the Web Site, host or network, including, without limitation, via means of submitting a virus to the Web Site, overloading, "flooding," "spamming," "mailbombing," or "crashing" the Web Site, (d) sending unsolicited e-mail, including promotions or advertising of products or services, or (e) forging any BIF packet header or any part of the header information in any e-mail or newsgroup posting. Violations of system or network security may result in civil or criminal liability. BIF may investigate violations of this Agreement and may involve and cooperate with law enforcement authorities in prosecuting users who are involved in such violations. You understand that all information, data, text, software, music, sound, photographs, graphics, video, messages or other materials ("Content"), whether publicly posted or privately transmitted, are the sole responsibility of the person from which such Content originated. This means that you, and not BIF, are entirely responsible for all Content that you upload, post, email, transmit or otherwise make available via the Service. BIF does not control the Content posted via the Service and, as such, does not guarantee the accuracy, integrity or quality of such Content. You understand that by using the Service, you may be exposed to Content that is offensive, indecent or objectionable. Under no circumstances will BIF be liable in any way for any Content, including, but not limited to, for any errors or omissions in any Content, or for any loss or damage of any kind incurred as a result of the use of any Content posted, emailed, transmitted or otherwise made available via the Service. You acknowledge that BIF may or may not pre-screen Content, but that BIF and its designees shall have the right (but not the obligation) in their sole discretion to pre-screen, refuse, or move any Content that is available via the Service. Without limiting the foregoing, BIF and its designees shall have the right to remove any Content that is or is deemed to be objectionable. You agree that you must evaluate, and bear all risks associated with, the use of any Content, including any reliance on the accuracy, completeness, or usefulness of such Content. In this regard, you acknowledge that you may not rely on any Content created by BIF or submitted to BIF, including without limitation information in BIF Forums, and in all other parts of the Service. You acknowledge, consent and agree that BIF may access, preserve, and disclose your account information and Content if required to do so by law or in a good faith belief that such access preservation or disclosure is reasonably necessary to: (a) comply with legal process; (b) respond to claims that any Content violates the rights of third-parties; (c) respond to your requests for customer service; or (d) protect the rights, property, or personal safety of BIF, its users and the public. You agree to indemnify and hold BIF, and its subsidiaries, affiliates, officers, agents, co-branders or other partners, and employees, harmless from any claim or demand, including reasonable attorneys' fees, made by any third party due to or arising out of Content you submit, post, transmit or make available through the Service, your use of the Service, your connection to the Service, your violation of these terms and conditions, or your violation of any rights of another. The Service may contain inaccuracies or typographical errors. Neither BIF nor its third-party content or service providers make any representations about the accuracy, reliability, completeness or timeliness of the Service, including without limitation any text, graphics (including calculators), sounds, images or other materials contained therein. The use of the Service is at your own risk. BIF reserves the right, in its discretion, to modify, add, or remove portions of the Service at anytime without notice. You acknowledge and agree that you are solely responsible for the form, content and accuracy of any information you upload to the Service. The information contained in the Service is provided for general guidance on matters of interest only and should be used for general education purposes only. Course information is provided with the understanding that the authors and publishers are not engaged in rendering legal, accounting, tax, securities, financial planning or other professional advice or services. Accordingly, it should not be used as a substitute for consultation with professional legal, accounting, tax, securities, financial and other advisors. The material presented is for educational use only and should not be used for making actual financial decisions. Consult a financial professional before making any investment decisions. THE SERVICE IS PROVIDED TO YOU ON AN "AS IS" BASIS WITHOUT ANY WARRANTIES OF ANY KIND. TO THE FULLEST EXTENT PERMITTED BY APPLICABLE LAW, BOSTON INSTITUTE OF FINANCE AND ITS THIRD-PARTY CONTENT AND SERVICE PROVIDERS DISCLAIM ALL WARRANTIES, EXPRESS OR IMPLIED, INCLUDING, BUT NOT LIMITED TO, IMPLIED WARRANTIES OF AVAILABILITY, MERCHANTABILITY, FITNESS FOR A PARTICULAR PURPOSE AND NON-INFRINGEMENT. WITHOUT LIMITING THE FOREGOING, BOSTON INSTITUTE OF FINANCE AND ITS THIRD-PARTY CONTENT AND SERVICE PROVIDERS SPECIFICALLY DISCLAIM ANY WARRANTY (A) THAT THE SERVICE WILL BE UNINTERRUPTED OR ERROR-FREE, (B) THAT DEFECTS WILL BE CORRECTED, (C) THAT THERE ARE NO VIRUSES OR OTHER HARMFUL COMPONENTS, (D) THAT THE SECURITY METHODS EMPLOYED WILL BE SUFFICIENT, AND (E) REGARDING CORRECTNESS, ACCURACY, OR RELIABILITY. TO THE FULLEST EXTENT PERMITTED BY LAW, BOSTON INSTITUTE OF FINANCE AND ITS THIRD-PARTY CONTENT AND SERVICE PROVIDERS SHALL NOT BE LIABLE FOR (I) ANY DIRECT, INDIRECT, SPECIAL, INCIDENTAL, CONSEQUENTIAL, OR PUNITIVE DAMAGES ARISING OUT OF THE USE OF OR INABILITY TO USE THE SERVICE (INCLUDING WITHOUT LIMITATION ANY INFORMATION PROVIDED ON OR THROUGH THE SERVICE), INCLUDING WITHOUT LIMITATION, ANY LOST PROFITS, BUSINESS INTERRUPTION, LOSS OF PROGRAMS OR OTHER DATA, EVEN IF BOSTON INSTITUTE OF FINANCE HAS BEEN ADVISED OF THE POSSIBILITY OF SUCH DAMAGES, OR (II) ANY CLAIM ATTRIBUTABLE TO ERRORS, OMISSIONS OR OTHER INACCURACIES IN THE SERVICE. You agree that BIF may, under certain circumstances and without prior notice, immediately terminate your account, any associated email address, and access to the Service. Cause for such termination shall include, but not be limited to, (a) breaches or violations of the Agreement or other incorporated agreements or guidelines, (b) any failure by you to pay to BIF amounts due hereunder, (c) providing false or misleading information, (d) interference with other users or the administration of our services, (e) requests by law enforcement or other government agencies, (f) a request by you (self-initiated account deletions), (g) discontinuance or material modification to the Service (or any part thereof), (h) unexpected technical or security issues or problems, and (i) extended periods of inactivity. BIF makes no claims that the Service may be lawfully viewed or downloaded outside of the United States. Access to the Service may not be legal by certain persons or in certain countries. If you access the Service from outside of the United States, you do so at your own risk and are responsible for compliance with the laws of your jurisdiction. This Agreement is governed by the internal substantive laws of the Commonwealth of Massachusetts, without respect to its conflict of laws principles. Jurisdiction of any claims arising under this Agreement will lie exclusively with the state or federal courts within Boston, Massachusetts, and you consent to the exclusive personal jurisdiction of such courts if there is a dispute between you and BIF. You may not institute any action in any form arising out of use of the Service or this Agreement more than eighteen (18) months after the cause of action has arisen. If any of this Agreement is found to be invalid by any court having competent jurisdiction, that invalidity will not affect the validity of the remaining portions, which will remain in full force and effect. No waiver of any term will be deemed a further or continuing waiver of such provision or any other provision. This Agreement constitutes the entire agreement between you and BIF with respect to the use of the Service. No changes to this Agreement may be made except by a revised posting by BIF on this page, and no waiver of any term will be effective unless it is in writing and signed by a representative of BIF. This page was last updated on 01/01/2007. 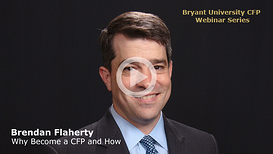 Enrollment for the Winter 2015 Virtual Session for Bryant University's Online Certification in Financial Planning remains open through February 10th. Enrollment for Spring 2015 Virtual Session now open (First Class: May 13th). Full Program packages start from $1995 $1795.